US, 1996, 105 minutes, Colour. Thora Birch, Vincent Kartheiser, Dirk Benedict, Charlton Heston, Duncan Fraser, Gordon Tootoosis. 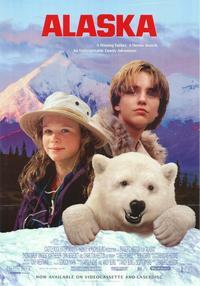 Alaska is a film designed for a family audience. It has beautiful landscapes (actually filmed in British Columbia). It is a story of children, it is a story of a pilot who gets lost in a storm, it is a story of the children undergoing all kinds of difficulties on a journey to rescue him. The children are played by Thora Birsh and Vincent Kartheiser. They encounter a poaching villain, Charlton Heston, father of the director. He poaches polar bears and is in a plot with a pilot to sell a bear to a zoo. However, the children let the bear go free – and it follows them. It also helps, finally, in the rescue of the father. The visuals are beautiful, and it is a film that will satisfy a general family audience – rather than critics. 1. An enjoyable film? For family audiences? Adults? Children? 2. The locations for Alaska, the mountains and snow, the valleys, the rivers, the rapids? The musical score? The general name and the evocation of the atmosphere of Alaska? 3. A family film, the father and the death of his wife, his work as a pilot? The clashes with his son, his son’s resentment about the death of his mother, the son insulting his father? The daughter and her love for her father? His going on the trip, going out of contact, the storm, crashing the plane, perched on the ledge? His survival? The plane slipping down the mountainside? His hanging on? The flares? 4. The two children, seeing them in action, fishing, the rapids? Their clashes with each other, brother and sister squabbles? Their relationship with their father? Sean and his anxiety at his father’s disappearance? His decision to go to find his father, packing up? Jessie, younger, her common sense? Their going off together? In the canoe, going through the rapids? The encounter with the polar bear, freeing him? Perry and his finding them, smooth talk? Their continuing on, the more difficult rapids, going over the waterfall? Their continuing by foot? The help from the local Indians? Their finding their father, the rescue, the rope, climbing? The bear helping them? Happily reunited? 5. Perry, Charlton Heston’s presence? With the pilot? Looking for the bears? Taking the cub? Its escape? The clashes between the two men? The searcher and their telling him lies about the children, breaking the oar? The final encounter, the reaction of the bear? Their being caught? 6. The background of the Indians in Alaska, at the stores, the air service? The search? The Indians and their camp? Helping the children – and the elder and his stressing the importance of their going on a significant journey for young people? 7. Familiar ingredients – but pleasingly done for a wide audience?